For Mother’s Day, William and Ernest gave me a Munakuppi Grass Grow Kit. 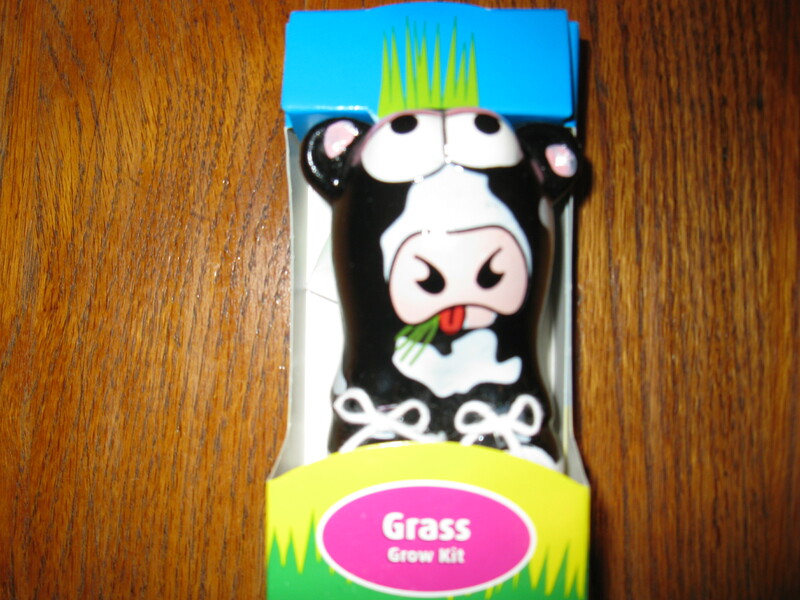 It includes a soil pellet, a packet of seed, and a cow. The seed is Italian, but it is distributed from Holland. The cow is a new breed: Chinese Holstein. I don’t know where the soil came from. You mix the soil pellet with 3 Tbsp of water, put 2/3 of the soil into the cow’s head, carefully pour in the seeds, and cover with the remaining soil. Then water and place in a sunny spot. Lightly water every day. In seven days, grass will appear. That’s when the fun begins. When the hair (the grass is now hair) grows to 1-1/2 inches, you can trim it, style it, or put bows in it. It will grow back after trimming. As I told the guys, the gift is just darling. Tomorrow I’ll construct a place that is both sunny and cat-proof. I expect the process to take all day. Or use the grass for cat food. Or cat emetic, more likely. We used to grow cat grass, but the lady cats ignored it. They preferred catnip. The guy cats might have other tastes, though. We’ll try it.